Please note that the content of this book primarily consists of articles available from Wikipedia or other free sources online. 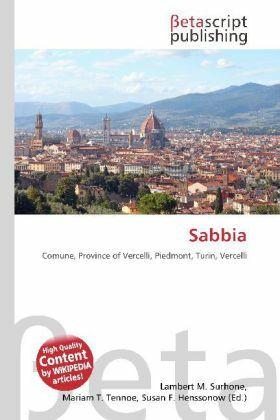 Sabbia is a comune (municipality) in the Province of Vercelli in the Italian region Piedmont, located about 100 km northeast of Turin and about 60 km north of Vercelli. As of 31 December 2004, it had a population of 78 and an area of 14.5 km². Sabbia borders the following municipalities: Cravagliana, Valstrona, and Varallo Sesia. Vercelli (Italian: Provincia di Vercelli) is a province in the Piedmont region of Italy. Its capital is the city of Vercelli. In 2003, the Sacred Mountain of Varallo was inserted by UNESCO in the World Heritage List.